Please find attached images of the arborglyph we found recently in the heart of the Nimpkish Valley. The photos are provided courtesy of the ‘Namgis Nation and Dawn Cranmer is pictured in two of the photos. I’ve also included an image of a ‘bark board’ we found nearby with Lee Waddams pictured. Arborglyph in Nimpkish Valley. Courtesy of ‘Namgis Nation via Jim Stafford. The site is one of many found this year as part of an inventory of the Nimpkish Valley being undertaken by the ‘Namgis Nation and led by me (principal archaeologist). We have been focusing on the travel corridors (trails and associated features), intermediate lakes and high elevation yellow cedar zones. The arborglyph feature is associated with a camp and subsurface deposits, which we will be investigating further in 2014. There was another similar incomplete feature nearby as well as several cedar ‘bark board’ type features (often associated with roofing for short term camps) [see below]. I estimate this feature dates to the late 19th/early 20th century and is possibly associated with a trapper’s camp. A significant fish pool also exists nearby and a survey crew spent significant time in the area in 1914, so there is much going on at this site, with traditional use likely spanning thousands of years and definitely continuing into the 20th Century. ‘Namgis carver (and CMT crew supervisor) Don Svanvik noted that this carving was a portrait made by his ancestors and using the same techniques carvers use today. 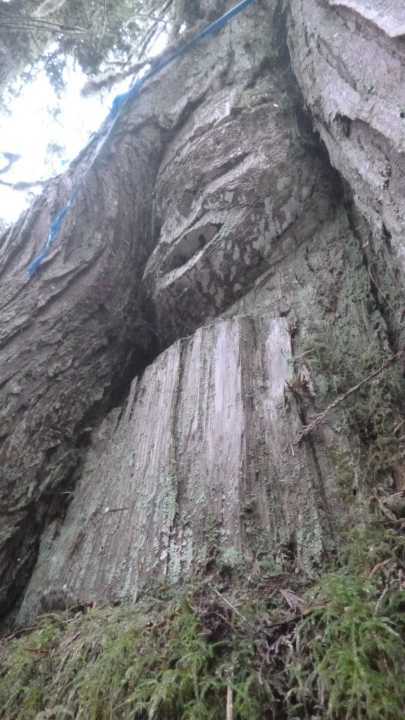 The carving has been damaged, with the nose and portion of lip removed, likely in the 1940’s, when the general area was logged. A small pocket of old growth forest remains around this site. This area will remain protected and is very significant to the ‘Namgis. Dawn Cramer alongside the arborglyph, Nimpkish Valley. Note the healing lobes encroaching on the carving. Photo courtesy of ‘Namgis Nation via Jim Stafford. Thanks very much to Jim for sharing his knowledge and for liaising with the ‘Namgis so we can all share this remarkable find and gain a glimpse into their long history. The picture below is of the rectangular bark scar Jim notes above. Imagine a few slabs of cedar bark perhaps one metre by two metres being used to construct a temporary shelter at a resource acquisition camp. These slabs are light and flexible, waterproof, and strong enough to form walls and roofs with minimal support. As with the picture above, the healing lobes around the scar can provide tree ring evidence of the exact year in which the bark was removed. Such precise and unequivocal evidence of ‘Namgis use of the Nimpkish Valley can be extremely important in establishing, in the western mind of the law, their traditional use rights and legal ownership of the landscape beyond their village sites. And it’s still a curious fact that the research potential of Culturally Modified Trees more generally has not been realized. In some areas, archaeologists would be drooling over the prospect of literally thousands (or hundreds of thousands province wide?) dots on the map with known cultural associations. If these were flakes then we’d see their potential more clearly, I suspect. I know of a few academic studies of these and I know some consultants, Morley Eldridge and Arnoud Stryd in particular, have done some interesting analyses. I’m on a ferry so I can’t do a lot of links, maybe one day a roundup on this topic here would be worthwhile. 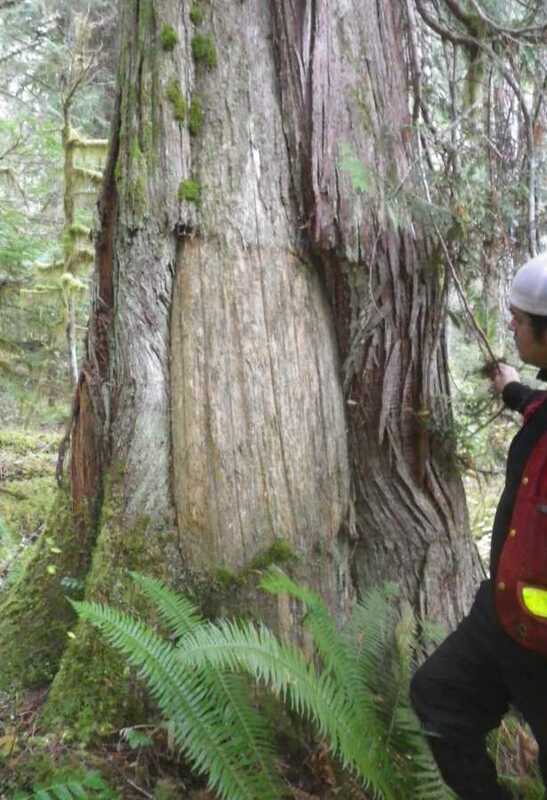 Lee Waddams inspects a rectangular scar in a cedar tree from removing a bark slab for use as temporary shelter. Note top and bottom cuts and healing lobes to side. Photo courtesy of ‘Namgis Nation via Jim Stafford. 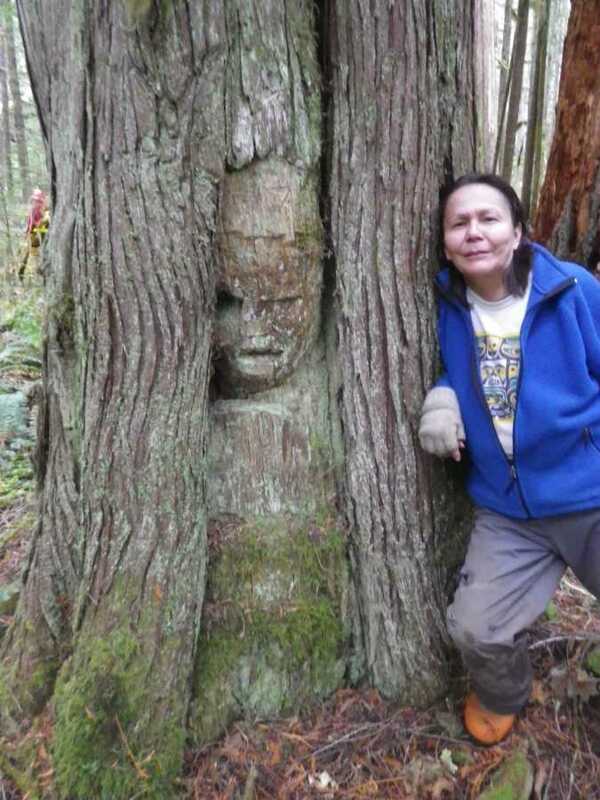 This entry was posted in Archaeology, Cultural Resource Management, First Nations, Northwest Coast, Vancouver Island and tagged 'Namgis, cedar, CMT, Culturally Modified Tree, Nimpkish Valley. Bookmark the permalink. Looks to me like the burl face was made by the guys who logged the tree, at the same time, and the latter photo taken some 20-40 years later. pareadolia – great word, will use often….. 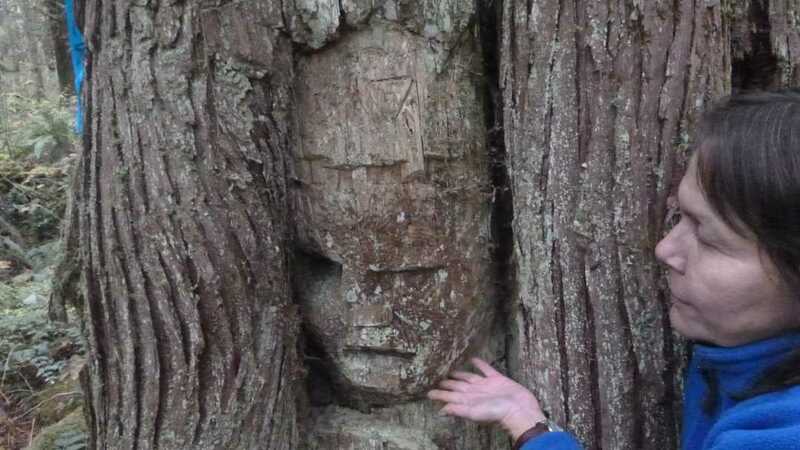 I dig a bit of digging around after recalling Bruce Ball’s find of a face arborglyph in the late 70s or early 80s. It was near Tumbler Ridge, apparently he sent it to the Royal Victoria Museum. If anyone is interested further, there should be an archaeology permit report that includes note and images of it (I recall a drawing) or perhaps a listing the museum accession lists if that’s what happened to it? The first CMT I ever saw was on the southern tip of Pender Island when I was very small, in the late 1950s or early 60s. The ‘Windships’, an elderly couple, had a home on the bluff on Gowland Point (or at least one of the fingers of rock that jut out into the strait there). Beside the house was an enormous Douglas-fir tree that had a very faint image of a face in a circle, with ‘tic’ lines below it. They said it had been carved into the bark by Indians long ago. I recall trying to get the student on an SFU fieldschool that was doing a site inventory of the island to look for it but never heard if they did. Perhaps it is still there? 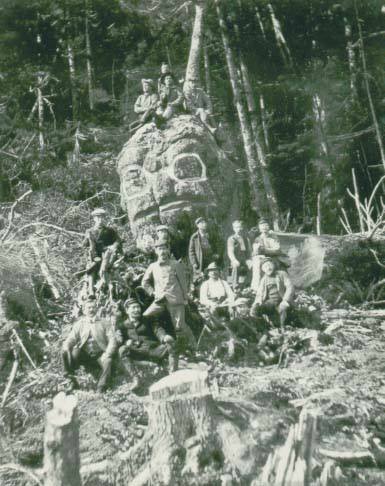 Many years later I found that the Archaeology Branch had a nearly identical-sounding carved Doug-fir tree in its records from Campbell River, that was recorded pre-Arch Branch. Then there was that one we recorded at Kispiox that was on the cover of Midden magazine – that was a graph not a glyph though. By the way, there was the earlier post comment about “arborglyph” being an improper mix of Latin and Greek? According to the etymological dictionary, ‘dendrochronology” is also a mix of Latin and Greek so we are in good company! Good luck with changing either…..
That’s good use of a stump, we do find the odd burnt out cedar at some CMT sites which could make good shelters or maybe served as smokehouses. Indeed, such burnt trees are a CMT type on Haida Gwaii and I have seen several near aboriginal logging areas and bark harvest/berry harvest areas, hypothesizing that these burnt out trees may have been burnt during the logging or harvesting to get rid of bugs – they also make great places to cache stuff or even possibly sit out of the rain. I was wondering if the smokehouse shown above was photographed by HI Smith, when he was there 1920-24 and checked out his catalog at the Canadian Museum of Civilization… some great images from that visit and lots to digest… speaking of which, here’s one of “Bella Coola children scraping the peeled trunk of cottonwood tree and eating the inner bark on island in Bella Coola River”. Oops, there goes my lunch break…. thanks for this Quentin! 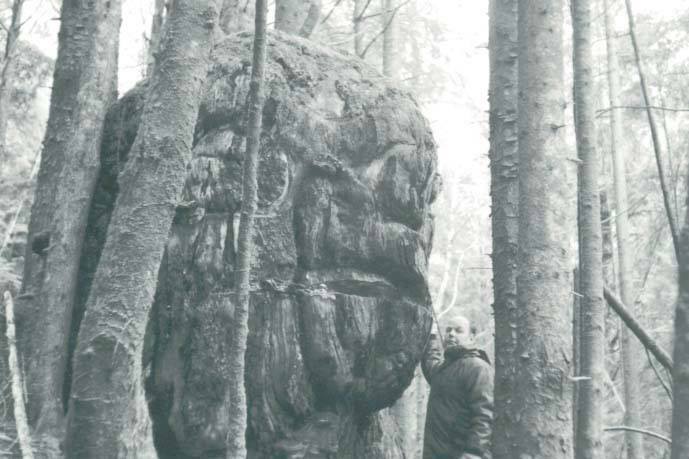 Oh I should include to be totally on topic that there is an arborglyph photographed by HI Smith near/south of Bella Coola (CMC Website), no image available – not sure if it is otherwise known recorded site. Thanks Jim. I edited the picture into your comment, hope that’s ok. That’s an amazing pic worthy of a post in its own right – brings the whole CMT thing alive. I’d like to know more about the HI Smith arborglyph. He sure got around. Belated thanks for this super-interesting bit of information, Jim.